These pumpkin-packed muffins with apples and walnuts are so light and fluffy your family will have no idea they’re actually good for you! As you’ve probably noticed, I add walnuts and other nuts to almost everything. I can’t help it – I like to feed my family nutrient-dense food. 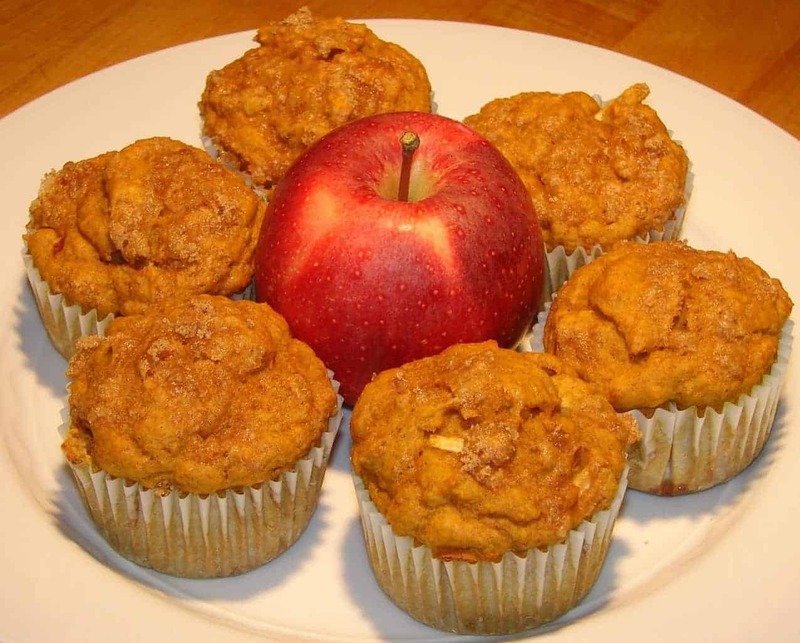 Which is why I couldn’t resist adding walnuts to these whole wheat pumpkin muffins made with chopped apples. A healthy form of protein and omega-3 fats, not only do nuts add flavor to sweet and savory dishes but they help keep you satiated. On any given day, you’ll find me adding nuts to stuffed peppers, grain salads, homemade granola, stuffed chicken breasts, chocolate chip cookies and more. It was such an incredible opportunity to speak first hand with the passionate, hard working farmers who make sure our grocery stores are filled with luscious nuts of all varieties all year round. Of course, I couldn’t wait to get in the kitchen the minute I got home. My older son is 3 and quickly losing interest in napping. Most recently, I found him in his room not-napping and he quietly whispered “mix muffins?” Who was I to deny him?! The verdict? These muffins turned out moist, fluffy and perfectly spiced with warm cinnamon, nutmeg and cloves. The walnuts give them a buttery flavor and the apples give them just the right amount of sweetness. As you can tell, Asher approved. These pumpkin-packed muffins with apples and walnuts are so light and fluffy your family will have no idea they're actually good for you! Pre-heat oven to 375 degrees and line a muffin pan with baking cups. In a large bowl, whisk together wet ingredients: eggs through melted coconut oil. Slowly add the dry ingredients to the wet and stir until fully incorporated. Scraping down the sides of the bowl with a rubber spatula then stir in chopped apples and all but two tablespoons of chopped walnuts. 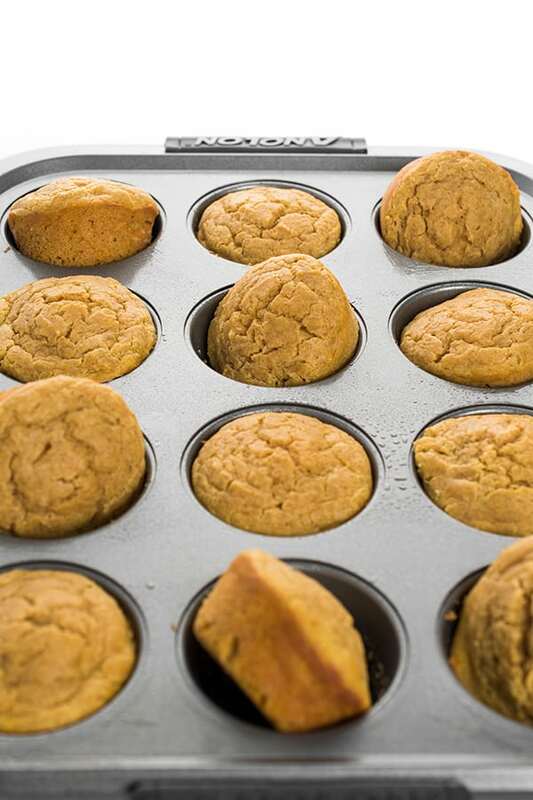 Using a large cookie scoop, divide the batter evenly between the 12 muffin cups. In a small bowl, combine remaining 2 tablespoons walnuts and 2 tablespoons of brown sugar and carefully sprinkle the top of each muffin with the mixture before placing pan in the oven. Bake for 25 minutes or until toothpick comes out clean. Let cool 2 minutes in the pan then remove and continue cooling on a baking rack. If you can't find whole wheat pastry flour, try white whole wheat flour or use half all-purpose and half whole wheat flour. You can use 100% whole wheat flour but the end result won't be as light and fluffy. Muffins can be kept in an air-tight container for up to 3 days or frozen for up to 3 months if individually wrapped in plastic wrap. 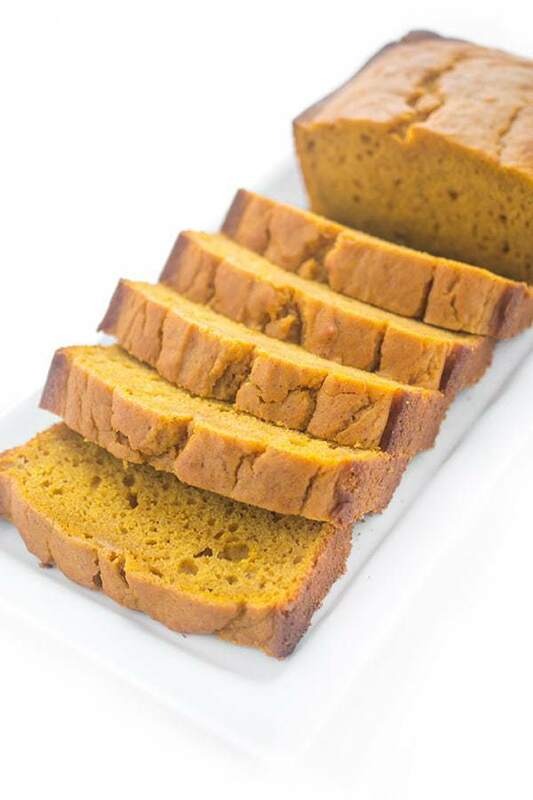 Do you add the pumpkin raw or do you cook or bake it in the oven until soft? Would like to try the recipe but got this doubt. Another question, as not living in the States we do not have apple sauce in Colombia, I substitute with normal sugar or honey? I used canned pumpkin which is cooked and pureed. Do you have access to that? Regular sugar would be fine! So funny – I just had that debate with family this weekend!! I love walnuts in everything, even chocolate chip cookies, but a few of my relatives agree with you – haha. That trip looked like so much fun, and these muffins look fab! I toasted up a big batch of nuts last week and have been eating my way through them as snacks all week long! I love the idea of stuffing them into muffins also. 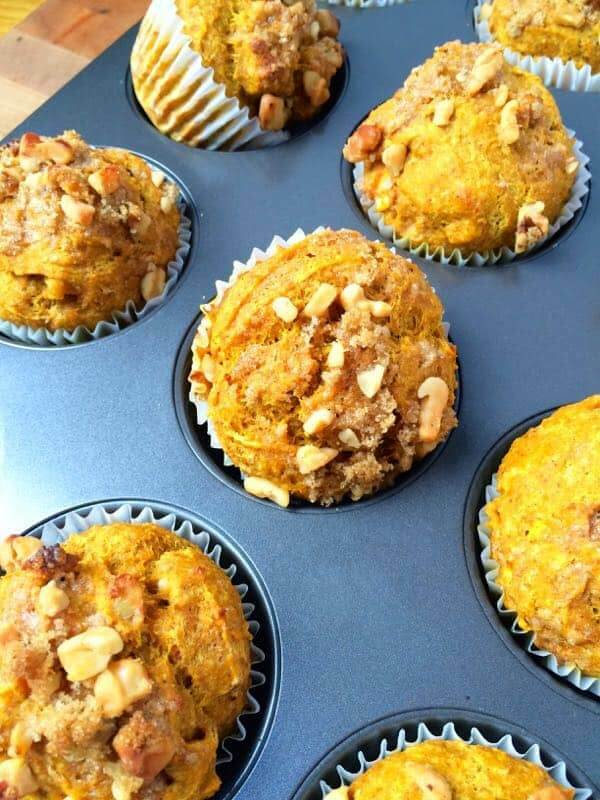 Especially pumpkin perfect muffins! Thanks for this wonderful recipe. I am joining the chorus as I add walnuts to everything. It just doesn’t taste right to me without that crunch. My husband is a diabetic. I pack him a lunch everyday of mini meals. A healthy muffin is always included. Can’t wait to make these for him. He’s going to love them…me too! The flavors in these muffins are wonderful!!! I love Diamond Nuts – the best! And these pumpkin muffins look awesome with their walnuts studded all over it. Asher is such a cutie pie. Trip looked so interesting and fun! And the muffins of course look fab. YUM!!! Love using whole wheat and have been using more spelt lately. I’ve been wanting to use spelt flour more! OMG these look totally amazing Liz! Also, fascinating pictures of the walnut trip, looks like you ladies had so much fun! Aww thank you so much! I loved how they turned out. Great post, what a cool trip! The muffins look yummy! Those walnuts look incredible, and the muffins! I love a good pumpkin muffin. Same here Shaina! Pumpkins just really lend themselves to baked goods. What a cool experience! I used to hate eating baked goods from my grandma, because she always added nuts to everything, but as I got older, I liked nuts in my baked goods more and more! That’s so funny!!! I love adding nuts to my stuff..always have. Ahhhh I love me a healthy muffin! Especially when it’s stuffed to the brim with all those goodies! These look so good Liz! Love the pumpkin apple combo. The best flavors of the season in one muffin :) Your son is SO CUTE!! Aww thank you so much Karen! I love Diamond nuts and I put walnuts in everything including my vegetable dishes. The muffins sound like my kind of breakfast! Looks like you had a great trip to California! Thanks Miss – it was so fun to watch walnut trees shake! I hope you love them Haley! Yummy! These look fabulous! Love the combination of flavors! Did you pick those walnuts yourself? 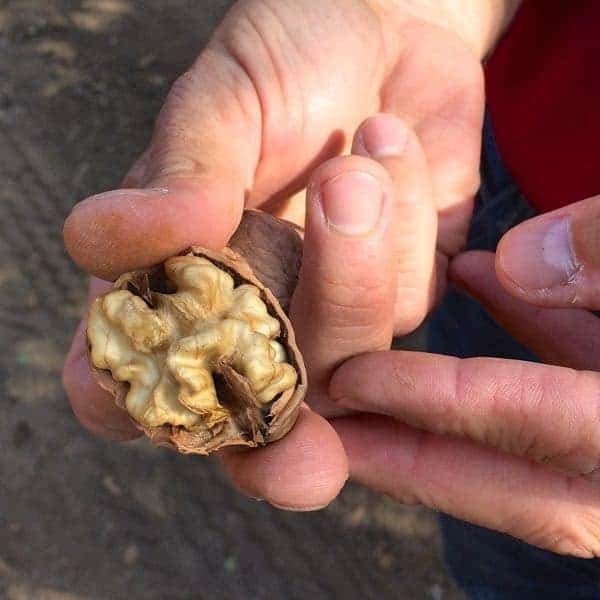 I have never seen a walnut in its shell before! Congrats on Diamond, that is very exciting! These would be a great runner snack! I didn’t pick these particular ones but I love that I know where they come from! Thanks so much!! :) IDEAL runner food!